I forgot to post this yesterday, but look who was featured on the Page-a-Day Calendar for August 19! “Abyssinians have an almost otherworldly look, which may be why one was chosen to play “Jake” in The Cat from Outer Space, a role shared by two cats named Amber and Rumple. 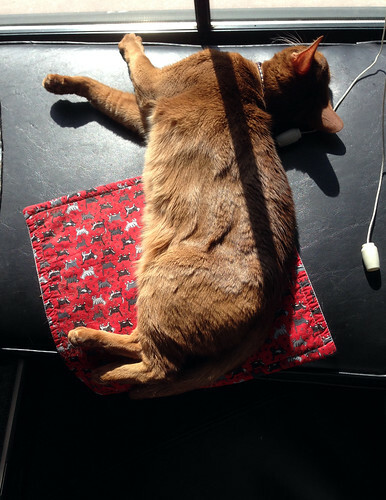 Playful and almost doglike in their devotion to their humans, the Abyssinian has become one of the most popular breeds in the United States, despite commanding high prices at pet stores and breeders. You could argue they earn their keep: Female Abys are remarkably skillful hunters, and often stay active well into their twenties. “The cat originally chosen to screen test was a young ruddy male, GC Ruddy Raider of Wil-o-glen. At that time he was in the middle of a show season and doing very well, so when Disney told me they wanted to buy him and that would end his show career, I said no thank you. They wanted to own the cat so there would be no interference from anxious owners. It is my understanding that there were up to 7 cats who were used in the movie. I do not believe they came from well known catteries. I also heard rumors that several of them from one cattery died of FelV which was a problem at that time. I was very glad that I had not exposed Raider to that. Raider went on to produce wonderful offspring and I never regretted my choice, although I do enjoy the DVD of the movie from time to time and think about ‘what if’. Well, at least we know which cattery didn’t breed them!